As my two years as a Master's student comes to an end, I am excited to present my Master's Vocal Recital Thursday, May 16, 2013, with my collaborative pianist, Michelle Lee. During the recital I will be presenting a video featuring my photography (both time-lapse, and fine-art landscapes). I will have a reception with light refreshments afterwards. The cost is free, but I am happy to accept donations in cash, check, or credit card. As a photographer, I experience (through a glass) the notion of “face to face” with the divine—a sense of taking part in the act of creation—a notion that, as I’ve learned in my study of artists through the ages, is not uncommon. I chose each of the composers and/or subjects based on their tenacious individuality, dedication to ideals, and magnitude of spirit. 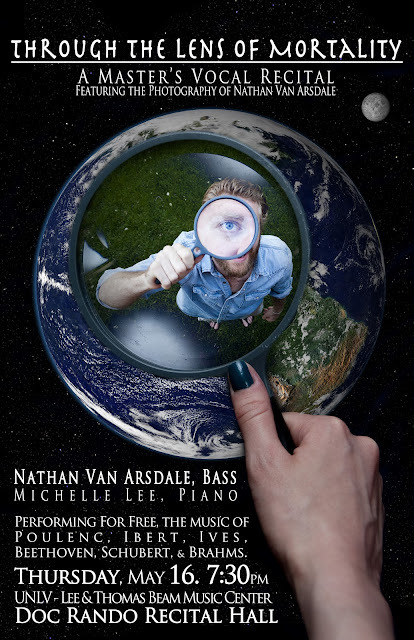 The still and time-lapse photos presented with this recital are all the original work of Nathan Van Arsdale. The program opens with a set from Beethoven, Poulenc, and Schubert: first a chiding request from a deceased person for the living to be grateful for what they have in life, and let sleeping spirits rest; followed by a call for people to be more Christ-like, banishing spiritual darkness and demons; and ending with a grateful celebration of the beauty of nature. The second half of the program opens with Chansons de Don Quichotte, a first person account of life and death through the eyes of Don Quixote. The title character decides to live life according to his ideals of chivalry: bravery, honor, and love; despite the rest of the world viewing reality quite differently from him. Death, for Don Quixote, is not and end or defeat… it is transcendence from mortality. Finally, Charles Ives provides musical commentary on the nature of life. Each piece reflects a bit of Ives’ personality with a twinge of brazen pontification, and innocent, somewhat arrogant individualism. Were Ives alive today, he would likely encourage people to pursue their desires with the gusto of Charlie Rutlage chasing after cattle: fearlessly, relentlessly, and unto death. NO SOUNDS (shutters, beeping, or other) and NO FLASH!!! After gaining a reputation as a virtuoso pianist while studying under Joseph Haydn in Vienna, Beethoven began to lose his hearing around 1800, and was almost totally deaf for the last decade of his life. An advocate of Napoleon and his revolutionary ideas of liberty and equality, Beethoven composed the symphony, Bonaparte, in tribute to the general—using unprecedented broad strokes of sound, sturm und drang (storm and drive), to explore the realm of the unconscious, and convey the more complex emotions of what it meant (to Beethoven) to be alive. This composition, later renamed Eroica (due to his disgust over Napoleon’s self-coronation), marks the beginning of Beethoven’s middle period, and is considered one of the most important works of the age. Composed shortly after Eroica (1806-7), In questa tomba oscura, by Italian poet, Guiseppe Carpani (friend of Beethoven, Haydn, Salieri, and Rossini), is written from the standpoint of someone who has recently died. Unable to take possessions beyond the grave, the spectre exhorts his ungrateful family for quibbling over the decease’s estate. The frustration expressed in the text—an admonishing “ingrata”—mirrors Beethoven’s frustration over living in a tomb of silence, surrounded by people who take their gift of hearing for granted. when I was alive, you ingrate. A French composer of over 150 mélodies, credited by Virgil Thompson as being, “incontestably the greatest writer of mélodies in our time.” Poulenc was dedicated to the poetry he chose for his songs, stating, “I believe that one must translate into music not merely the literary meaning of the words, but also everything that is written between the lines, if one is not to betray the poetry. Each, poetry and music, should evoke the other.” Hymne, is a poem translated by Jean Racine (1639-1699) from the Roman Breviary. Hymne is a statement of rebirth from a dark world into the light of the love of God, a plea for enlightenment for those dwelling in the shadow of death, and a pledge to always glorify God—to have Heaven on Earth. De votre empire affreux un Dieu nous affranchit. Redonnent la couleur et l'âme á l'univers. Et sous ton divin joug range nos volontés. Des malheureux assis dans l'ombre de la mort. From your dreadful empire, God frees us. Restoring color and soul to the beloved universe. And beneath your divine yoke, subject our will. The wretched ones crouching in the shadow of death. And even when centuries have finished their course. “The accompaniment reflects not only 'the moon-flecked river ripples and the glistening willow leaves' (Capell) but also 'an abundant fullness of heart' (Einstein). The piano writing swells and surges at certain moments, and at others is as sensitive to the tiniest inflection of ever-changing mood as a silver bromide photographic plate. It is quite extraordinary how at the beginnings of Verses 4, 5 and 6 (each beginning with the narrator's finger pointing at something new in a different direction) the composer uses changes of harmony to vary camera shot and angle as we zoom in on a new detail in the panorama. The final verse as it returns to the home key of E flat seems to gather up the energy of the preceding seven verses ('Drum auch winkt's'—'That is why and how I've been drawn back here'). At the very end, the sounds of true love (those beguiling sixths make a final appearance) seem to make the poet re-focus his gaze from the distance and turn to someone much nearer, the only ornamentation in the vocal line being a tender turn at the last moment. He seems to realize that this picture of nature has become even more beautiful and meaningful because of the tender empathy he has found by his side.”-notes from the Hyperion Schubert Edition. Laßt mein Herz nicht ruhn! Lets my heart not rest! On which the moonlight is lingering? Glittering with flakes of silver? Both a traditionalist and innovator, Johannes Brahms’ music, while rooted in the techniques of the Baroque and Classical masters such as Bach, Beethoven, and Mozart, created bold new approaches to harmony and melody, advancing the Romantic idiom. Close friends with Robert and Clara Schumann, Brahms became very attached to Clara, with whom he also performed extensively. Brahms became the intercessor between Robert and Clara after Robert was confined to a sanatorium until his death. After Robert Schumann’s death, Brahms rented the apartment above the Schumann’s house, and sacrificed his career and art for Clara’s sake. If Clara and Johannes were lovers is unknown, but they destroyed their letters to each other, suggesting more than merely a desire for privacy. Vier ernste Gesänge is a cycle of four songs dedicated to Max Klinger (a German sculptor and engraver), with texts taken from the Bible (the first three from the Old Testament, and the last one—focused on faith, hope, and charity—from the New Testament). Clara Schumann suffered a stroke on March 26, 1896, and Brahms completed this, his last set of songs, two months later in anticipation of her death. and all turn to dust. and the spirit of the beast rides downward under the Earth? for that is his portion. that he may see what will happen after him? That they had no comforter. That which is done under the sun. And probably like to eat! O death, how well you're doing! and would not have love, I am nothing. The top prize-winner of the Prix de Rome with his first attempt, despite the disruption of serving in WWI, Jacques Ibert was a successful composer who began study at the Paris Conservatoire in 1910, and later ran both the Paris Opera and the Opéra-Comique. His compositional style is described as eclectic, as he did not ascribe to any particular musical fashion or school, stating that, “all systems are valid.” Ibert composed in numerous forms, including opera, ballet, piano, orchestral, and film. His film credits include Macbeth (Orson Welles, 1948), Circus (Gene Kelly, 1952), and numerous French films. The producers of Don Quichotte (starring famous operatic bass, Feodor Chaliapin) separately approached five composers to write songs for the film (Jacques Ibert, Maurice Ravel-a friend of Ibert’s-, Marcel Delannoy, Manuel de Falla, and Darius Milhaud. Each composer believed they were the only person asked to compose music for the film, but Ibert’s was the music chosen for the film. The film was produced in French, English, and German, with Chaliapin starring in all three versions. The character Don Quichotte, derived from the classic novel Don Quixote (v.1-1605 & v2-1615) by Miguel de Cervantes (1547-1616), has read so many chivalric novels, that he chooses to see the world in a way where reality is what he makes of it. In the course of their travels, the protagonists meet innkeepers, prostitutes, goatherds, soldiers, priests, escaped convicts, and scorned lovers. These encounters are magnified by Don Quixote’s imagination into chivalrous quests. Don Quixote’s tendency to intervene violently in matters which do not concern him, and his habit of not paying his debts, result in many privations, injuries, and humiliations (with Sancho often getting the worst of it). Forçant les coeurs à lui faire service. Sans être tel ne peut gagner la place. forcing hearts to her service. can enter without being such a person. Si je ne vois ma Dulcinée. Dans chaque aurore et chaque fleur. Etoile de me longs chemins. Quand il passé sur les jasmins. If I see my Dulcinea. In each dawn and each flower. Star of my long wanderings. When it passes through jasmine. Votre éclat non pareil et votre précellence. Your brilliance and your unparalleled preeminence. Such is the strange fate of poor Don Quixote. Spiritualist, optimist, idealist, individualist, innovator, and fiercely democratic, Charles Ives stands out among composers, and yet, is considered one of the most representative of American artists. His father, George Ives, was a band-leader who would often experiment with music (there is record of him starting two bands marching from opposite ends of town towards the center while playing different songs). Charles to respected the power of vernacular music from early on, which shows in many of his compositions that borrow from folk and hymn tunes. He composed over 140 songs, but because he was independently wealthy as an insurance salesman, he didn’t care if they didn’t get published, or if people liked them, and many of them remained in manuscript form or as sketches for years after his death. Ives was a free thinker with a love for transcendentalism and sense of humor (often setting texts by Ralph Waldo Emerson, Henry Wadsworth Longfellow, John Whittier, Oliver Holmes, and Walt Whitman). His musical style developed from the French and German school into something entirely American. After WWI, Ives lost faith in the progress of humanity—a change that is noticeable in his later works. Despite being very eccentric, Ives was a musical genius, capable of creating highly organized, yet unique musical ideas. The Cage is Ives’ shortest, and most enigmatic song. The musical pattern in the prelude (repeated “two or three times”) sets the stage for a pacing leopard. Although there are no meter markings, The Cage is tightly constructed: the vocal line (text by Ives) consists of whole-tone scale segments, and the piano chords are stacked on perfect fourths (like the even spacing of cage bars). The song ends with one last staccato eighth note in question, “Is life anything like that?” Tarrant Moss is a text by Rudyard Kipling, but because Ives couldn’t get the rights to use the text for his composition, he used the same music under his own text in Slugging a Vampire, with only slight variations. However, the character in each song is the same voice—the voice of a somewhat arrogant tough guy protagonist. Charlie Rutlage had been called “the greatest country-and-western number never to be performed at the Grand Ole Opry.” The text, a description of a cowhand who gets trampled during a roundup, comes from a 1920 printing of Cowboy Songs by John A. Lomax. He stopped only when the keeper came around with meat. And ever I mourn my loss. And not for the men of the Moss. Then I landed on his beak. ‘Twill be hard to find another that’s liked as well as he. The first that died was Kid White, a man both tough and brave. Nothing came back from him; his time on Earth was spent. The shining throne, the shining throne of grace. This would have not been possible without your patience, guidance, inspiration, love, and support!